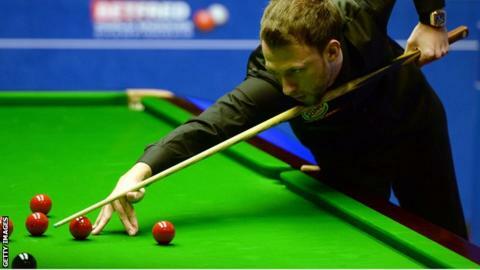 Judd Trump held off a fightback by qualifier Stuart Carrington to win 10-6 and set up a World Championship second-round meeting with Marco Fu. The 25-year-old resumed with a commanding 7-2 lead on Thursday. Carrington won three of the first four frames of the second session to give 2011 runner-up Trump a scare, but was ultimately left with too much to do. Masters champion Shaun Murphy also progressed to the second round, beating Finland's Robin Hull 10-3. Murphy - who won the 2005 World Championship as a qualifier - also led 7-2 overnight but, unlike Trump, he did not have a fightback to fend off, swiftly winning the three frames he needed on Thursday. He will face Joe Perry in the second round. World number six Trump, who beat Ronnie O'Sullivan in the World Grand Prix snooker final last month, was pushed hard by the impressive Carrington, who was making his Crucible debut. Despite struggling to finish off the Grimsby potter, Trump remains confident of his chances of claiming a maiden world title. "Stuart played really well. He played as good as anyone I have seen first time here," he told BBC Sport. "There is a lot of anticipation this year. I think my results have shown I am playing some good stuff, there are a few things I have to work on but other than that I am feeling confident." "Judd obviously did the job well in the first session and he probably thought it was job done. He got over the line but I don't think he was ever on red alert. However, Stuart Carrington showed what he was worth." Carrington had been swept aside by a dominant display of heavy scoring by Trump on Wednesday, but he was in determined mood throughout the second session, starting with a break of 97 in Thursday's opening frame to make it 7-3. Trump lost two of the next three frames to lead by just three at the mid-session interval, and although he won the 15th frame to move within one of victory, he missed a simple red to hand Carrington a lifeline. However, Trump regained his composure with a break of 109 in the 16th frame and finally secured his place in the second round. "Judd played really well but I was pleased with the way I fought back," said Carrington. "I didn't want to lose 10-2 so in the second session I went for my shots, played pretty well and scored pretty heavily and put him under some pressure."